Are you just starting out? Or in the market for a second board? 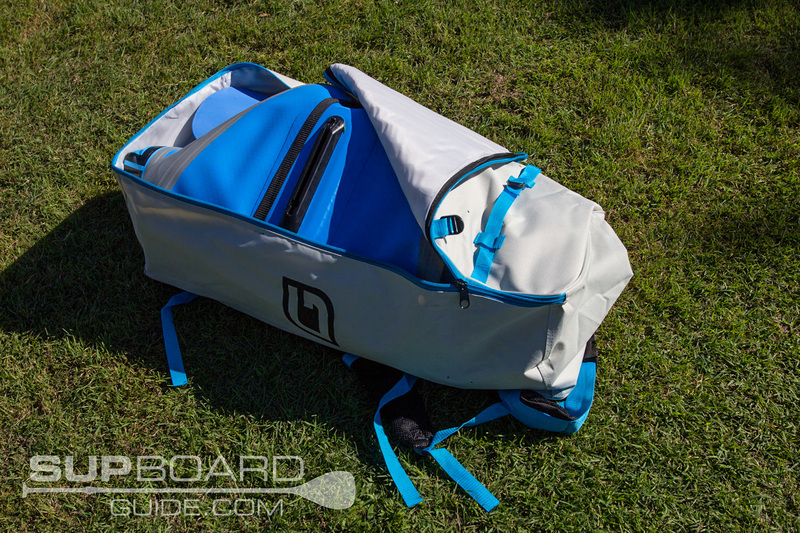 While there are some better-made boards with higher quality accessories on the market, they are double or triple the price of the Gili (from $465.00). 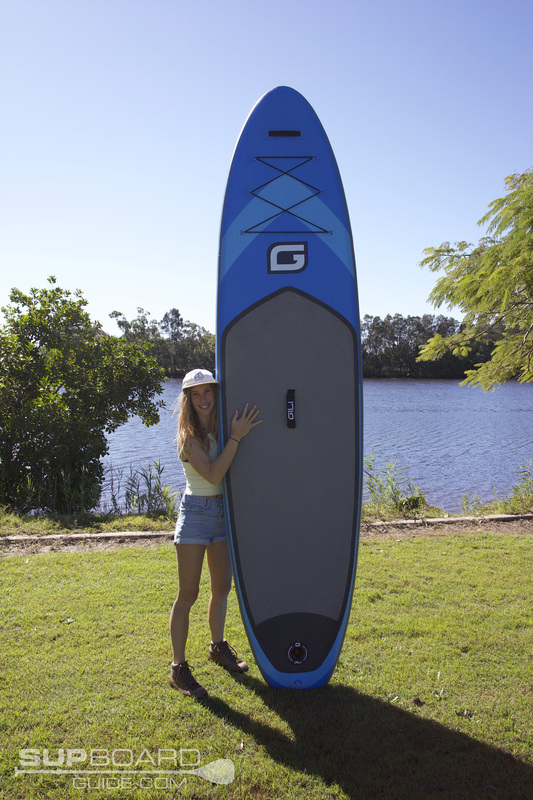 Looking at other budget boards that cost about the same, you get a lot less than what you get with the 10’6” Gili Air. 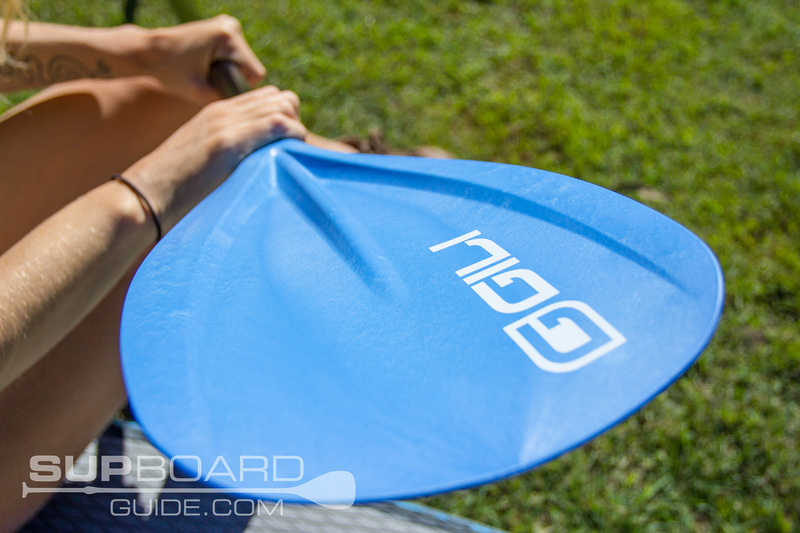 Gili Sports has designed a board that is entirely affordable but still tried to make something that is a useful buy. Something that will last more than one use, something that delivers a good level of performance and fun. Now I’m only little, 55kgs, so I will be giving this board to a bigger rider at some point and getting back to you about rigidity then too! The Gili surprised me. For a budget board, it sure could paddle. I set off on the calm waters of a lake nearby with only a slight wind in the air. This section of the lake actually is tidal, so as the day went on, I was battling tidal currents. Then the wind whipped up too! To start, my initial observations were on speed and stability. For a budget board, it tracked quite well. Which is where the speed came from but also because it’s quite slim at 31” wide. The first few strokes were a little bit of a push, but once I was going, it held speed quite nicely. On par, to some of the mid-range boards like iRocker All-Around and Isle. Now it’s important to note that I used the included paddle. Which had quite an effect on the speed of the Gili Air. Why? Because unfortunately, it’s not a very good paddle. More on that below. I believe had I brought along with me one of my carbon fiber or fiberglass paddles, I would have felt quite a difference. When I was challenged by tides and wind, I had some issues. There isn’t much rocker in the nose, so it was kind of like pushing an elephant up Mt Everest. The 6” is good for stability and buoyancy for the bigger riders, but for little me with no rocker in the wind, I just got swept away. I don’t mind having a single fin setup, but it does limit performance. As I stated, it tracked well, but the turning was a bit slow and staggered. The lack of side fins also did make trying to do back foot turns a little wobbly. What I was surprised was that at only 31” it still felt very stable. I put this down to the shape of the board. It has very rounded edges and a flat profile all the way through. That kind of profile obviously makes for a stable board, but the let down is the decrease in performance. So, all of this summed up tells me one thing. It’s a fantastic beginners board. Also, it’s cheap but not going to be a complete let down like many other boards under $500. There’s way more performance than say the Zray or Aqua Marina Fusion which are in the same price range. 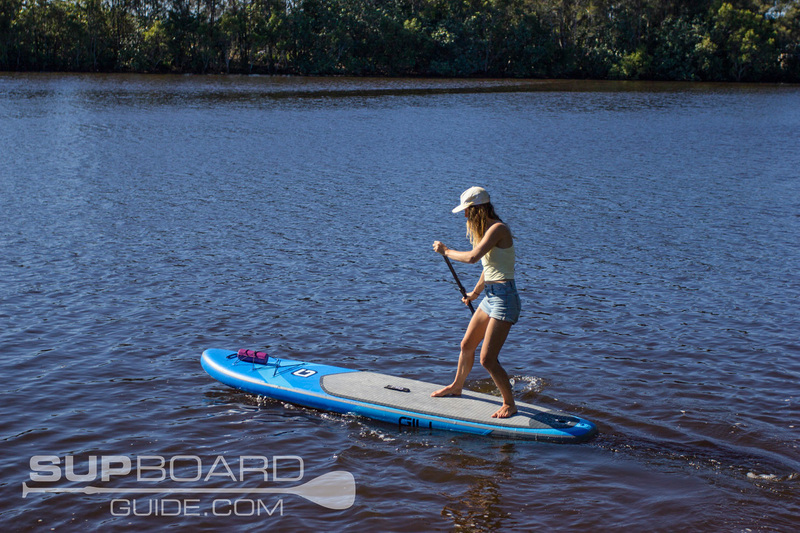 You won’t want to be doing much else than touring or cruising calm waters, but for many, this is all you desire a SUP for! For a full package including leash, bag, and paddle…It’s a pretty damn good value. 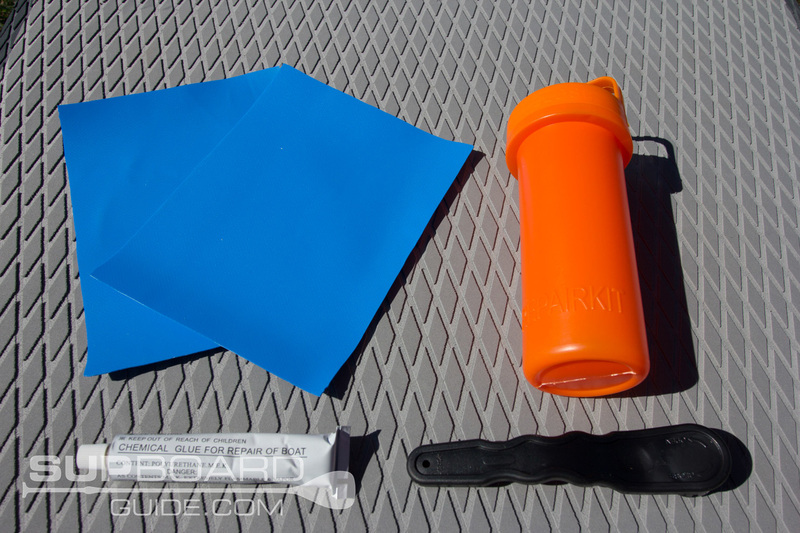 Even though the accessories definitely could be improved as well as the profile and fin setup, the person just wanting something for an occasional paddle will be super happy with what you get. Starting by looking inside, you’ll find a drop stitch core. 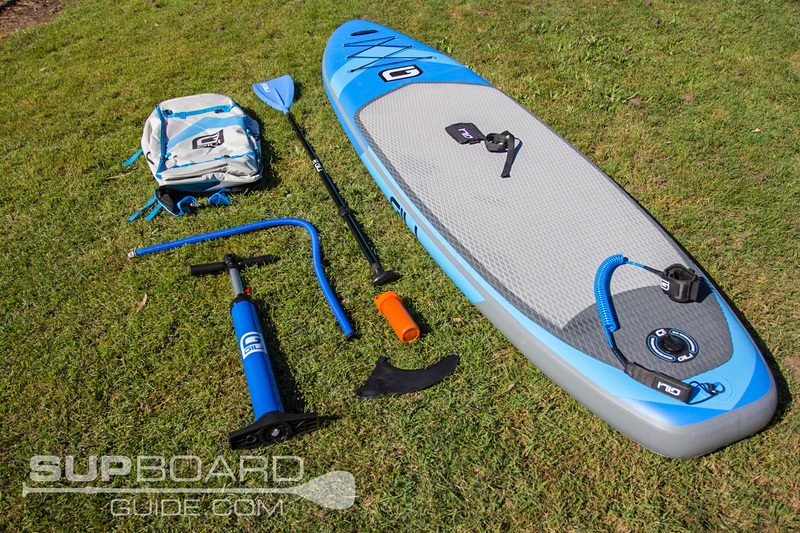 Much the same as every other inflatable SUP. Some drop stitching is higher quality, some lower, unfortunately, you’ll never know that for definite unless you were to cut your board open. Which I don’t think anyone wants to do! Part of the reason I noticed speed might be due to the single layer PVC. This also results in it being extremely lightweight. These are the positives from using single layer PVC. However, there are negatives too. Things like durability, it goes without saying that this board will not be nearly as durable as the double or triple, or even like the new iRockers, quadruple layered boards. 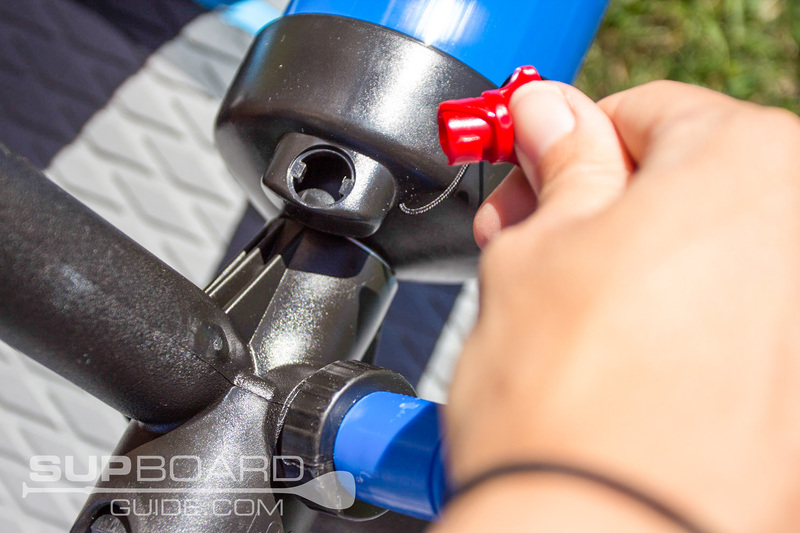 Using single layer PVC keeps the cost price down, but in the long run, if you are taking your board places where it’ll get banged up, it might cost more. As you can see in the photo below, the materials also don’t finish nicely. These bubbles at the end of the board aren’t anything to be too worried about as they just aesthetic. It’s not going to mean you’ll pop your board but it just shows that a lower quality of materials/manufacturing has been used. Many inflatables get this bubble on the tail, it’s just a result of the curves. 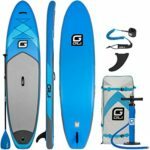 The only boards I don’t see it on is inflatable SUP’s that use fusion like the ERS and Red Paddle Co. If you plan on thrashing your board through rocky rivers or bouncing off logs, you may want to invest in something a little more durable. Then finally on top is the deck pad. I do enjoy how they’ve extended the deck pad to over the rails slightly. 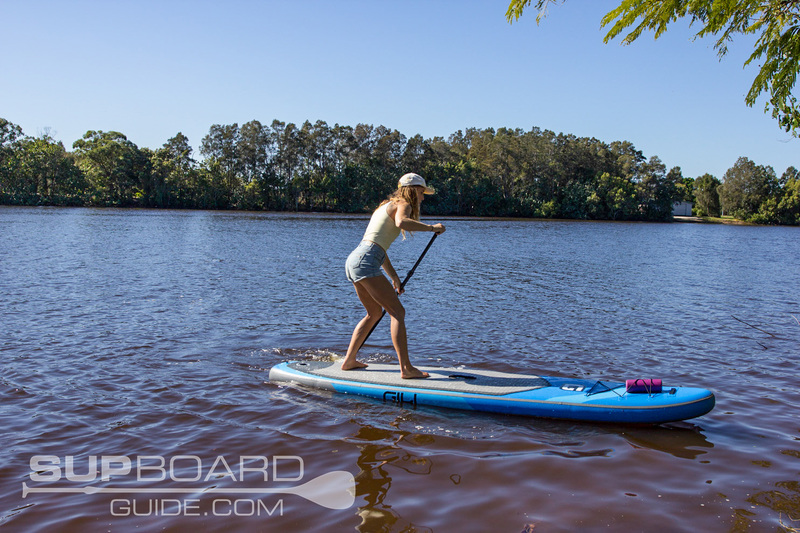 It makes things like SUP yoga very enjoyable, especially as the handle also can open up and lay flat, so nothing digs into your back. It’s a diamond grooved deck, and I found it to be very grippy and cushioned. 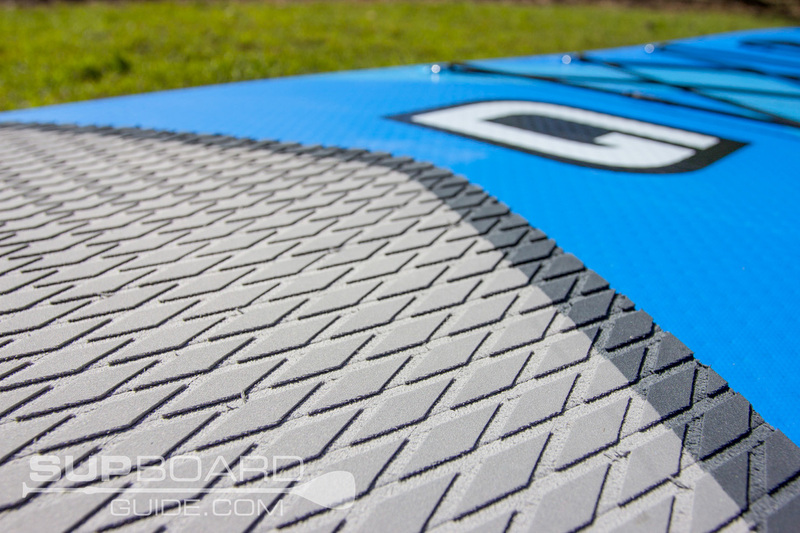 Nothing like the recently reviewed ERS deck pad but that’s two very differently priced boards too! UPDATE: Gili now has a tri-fin setup! Woohoo! I do feel the Air is a little bit lacking in the fin department. The fin box is a little fiddly, and the center fin is the generic snap lock. Though I don’t say that with a cynical tone as I personally love the snap lock. It’s so easy and quite to install a fin. So long as it’s been put together well and it doesn’t come loose. It’s got my vote. Flexy fins are always a favorite as they can bend and move around objects to avoid damage but the hard plastic fin included with the Gili Air can also take a bit of beating. Inflation was all pretty smooth sailing. The pump included does a fantastic job. It’s no Titan, but it certainly matches up to the included pumps in mid-range boards. One thing is for sure, it blows the budget SUP pumps out of the water. The recommended PSI is the same as many other SUP’s at 15 PSI and was achieved in 8 or so minutes. I also hooked my electric pump up for a second inflation. Of course, that was a lot quicker. However, I did have some trouble getting it to secure to the valve. I need to further inspect this as it might be my hose fitting! Please let me know if you have experienced this at all! Deflate super simple as always too. 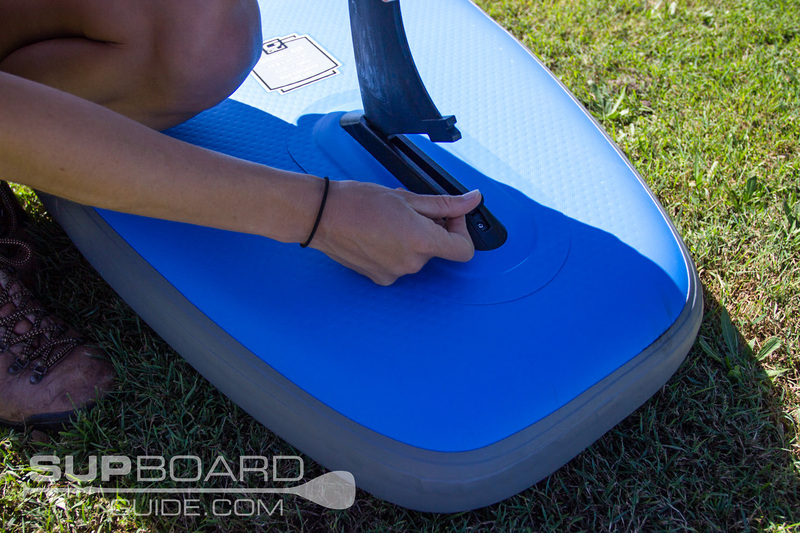 The pump also has a deflate option which makes rolling up the board just that wee bit easier. You heard me before touch on the body design of the board. I mentioned the flat profile and rounded shape. Almost sausage-like. Perhaps it’s more pronounced because of the deck pad rounds over the edges too. Aside from the body and deck pad, here I’ll point out the other bits and pieces on top. You can find 6 D-rings, very well placed with a bungee cord. This part, Gili Sports, they’ve done a great job at. It really bugs me when there is a limited storage area. All that deck space unused! The D-rings are little flimsy, but they seemed to be secured well. On the tail is also the D-ring for your beautiful color-coded leash! Then as pre-mentioned in the materials, the handle in the middle can be undone. 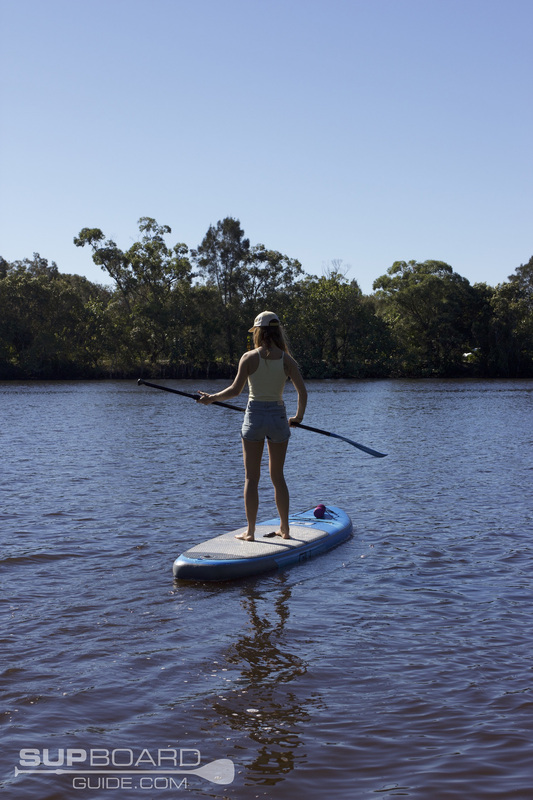 Either use it flat, so you have a comfortable lying deck or secure your paddle into the velcro. Though I found it hard to wrap around the paddle shaft entirely. 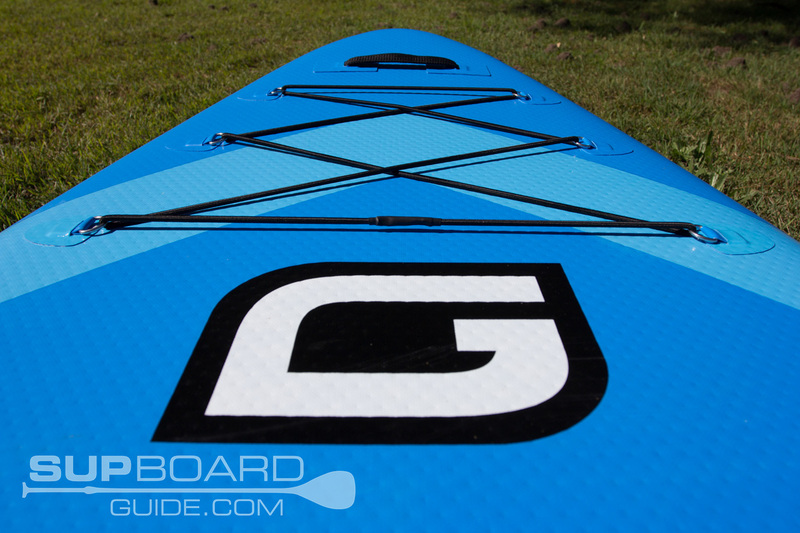 It’d be very wishful thinking to expect a quality paddle included in a budget board. It just wouldn’t be possible! 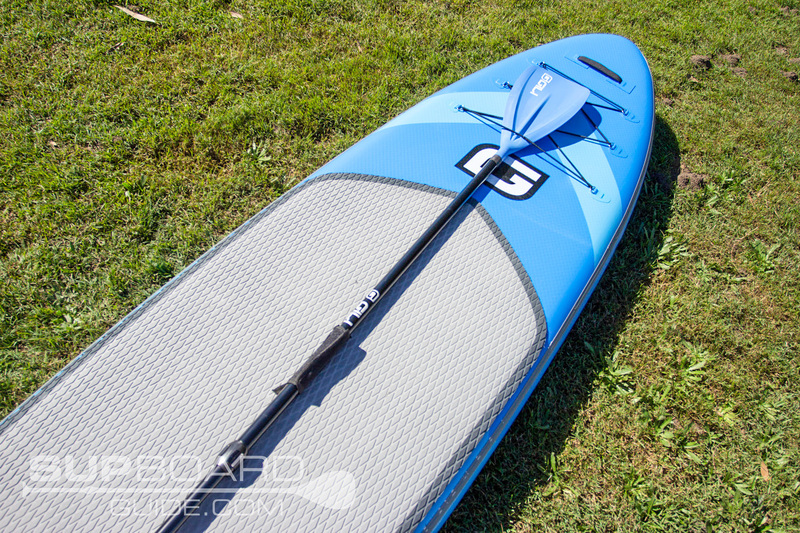 The aluminum paddle is enough to get you started. It adjusts, it floats and is marked with both paddle length and your height size. Then the downsides are its heavy, feels slightly flimsy when put together and the handle has no grip or comfort. And to finish this compliment sandwich off, the blade feels quite durable. It’s got a pronounced ridge through it for propulsion, but I thought it a little narrow. 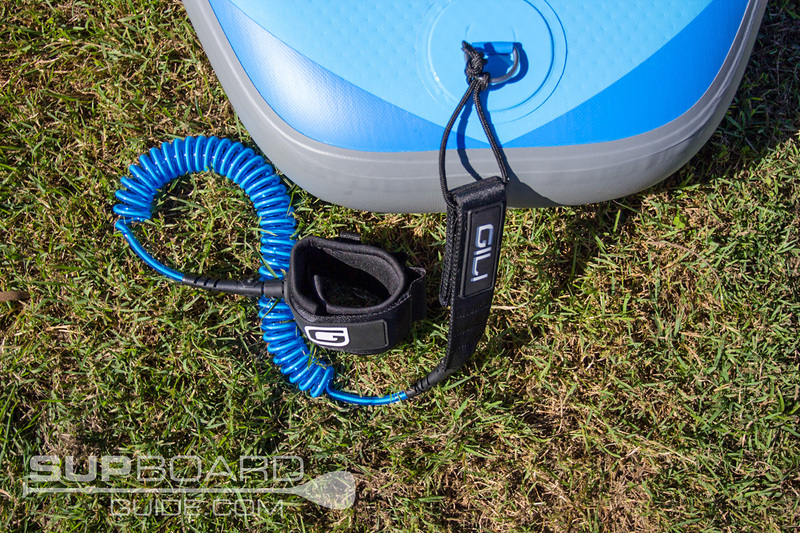 A hybrid leash color coded leash an be found in your pack to keep you safe and attached to your board! I like the color, and I like the hybrid of being a coiled and straight rope leash. Previously, I always preferred the coiled leash, but this may be the beginning of a new preference! The ankle cuff is snug and velcro strong! No key stash spot though. Which I need, I always lose my keys! When I first laid eyes on the backpack, I did like it very much. Mainly the style and color. The bags practicality could be improved though. There aren’t any straps inside to secure your bag, the zip only goes all the way down on one side so it’s a little tricky to get your stuff in and it’s a bit small. Though one thing I can praise is the straps. These straps are well padded, and they offer a good amount of support. Now, if you take this bag and put it up against say the Aqua Marina Fusion (same price range), well the Gili Air bag has a celebrity status. Comparing it to other bags in this price range, I have to say it’s amazing. 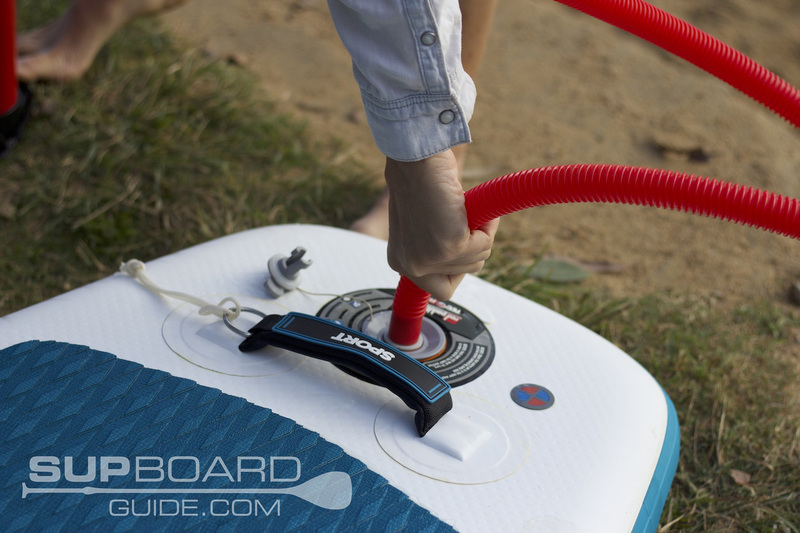 To inflate your board you’re supplied with a dual action high-pressure pump. Dual action meaning you can pump and exert air on the pull-up and push down and switch it back to single for the high pressures. It’s not the fastest pump but it gets the job done and keep cost price low. It took me about 9 minutes to inflate as this board does hold a bit of volume. On top of the pump, you can keep your eye on the PSI level with the integrated pressure reader. Recommended PSI is 15! Of course, you are supplied with your little orange friend the repair kit. Much the same as all kits, a couple of patches, valve tool and some glue! Keep this guy nearby at all times. It’s always the day you think you won’t need it that you do! 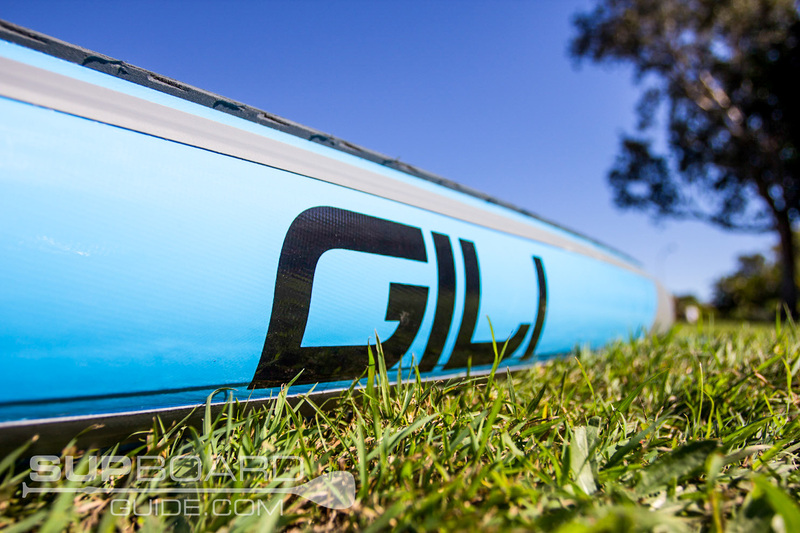 If you absolutely can’t make the stretch for something with a little more oomph in its performance and accessories, you’ll be getting one of the best deals you can with the Gili Air. 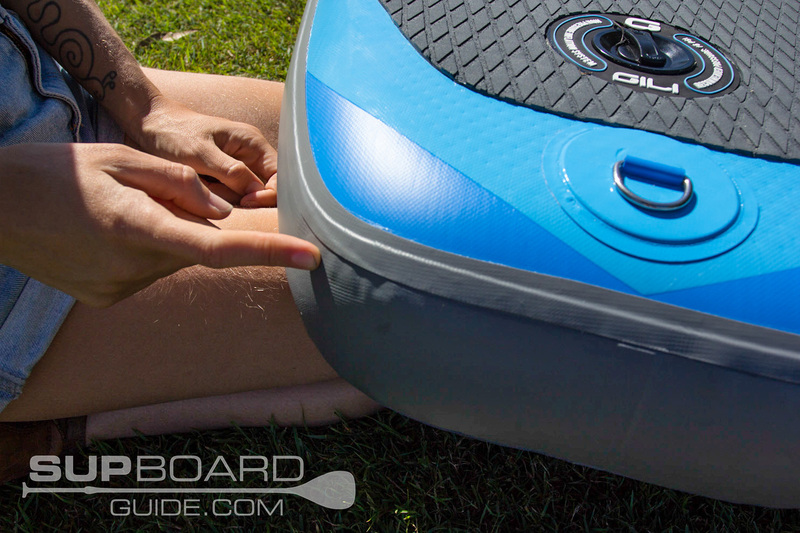 The most important parts of enjoying your SUP is the prep and the actual ride. As I noted, the pump is great, better than great comparing it to other pumps in this price range. The bag and features also outdo many others. You can’t expect some high-performance behavior from a board in this range, but I do have to express how well it tracked it a line and held some speed. I had many of my expectations exceeded! If you have access to a better paddle, you are either starting out or just need an extra SUP for the odd occasion, give the Gili a go! If you desire more answers, please ask any questions. That and let me know if you have the Gili too and how you find it.